Glory Hole: Awesome, Frightening, But Dangerous? There's been a lot of news coverage of Lake Berryessa during the last few days now that the Glory Hole has spilled again for the second time in three years. The photos and videos taken by the Lake Berryessa News Drone have amazed, and frightened, people who have never seen the Glory Hole in action before. Inevitably the question is raised about the danger of the structure. It's difficult to get close to the Glory Hole at any time due to the barriers in place. And only a fool would cross the buoy line to get close to it when it's flowing strongly four feet over the edge, as it is now. 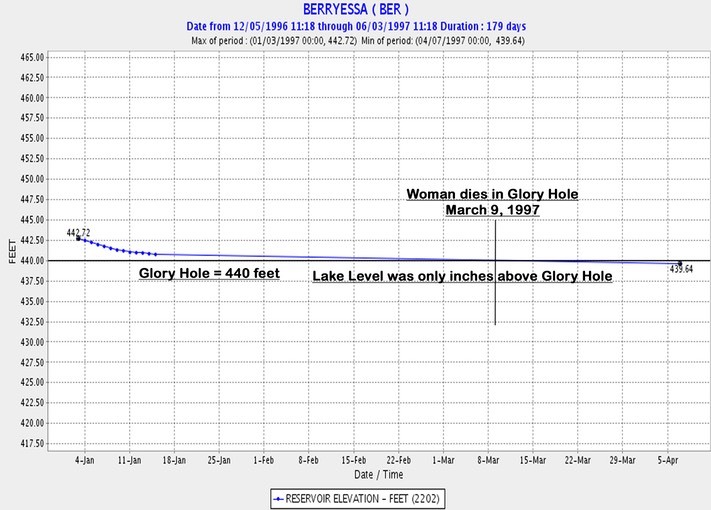 The Glory Hole has only spilled 25 times in 60 years. This year is the 26th. But back in 1997 a woman did die when she “fell” in. In the story from SFGATE below you can see that the water was not very high if she were able to grip the top for so long.There was speculation at the time that she had purposely pushed herself over the edge, not been "sucked" in. Witnesses had tried to talk the lady for many minutes to convince her to swim to shore, but she refused. Data shows that the lake level was only a few inches above the lip of the spillway. She was never “sucked” into the spillway. Her body was found several hours later in Lower Putah Creek. SFGate EDITOR'S NOTE - 2017 Update: This story is from 1997. It is being resurfaced by other sites and on search due to current coverage of the Lake Berryessa Glory Hole spilling over in February 2017. Napa -- Emily Schwalek, 41, of Davis was killed Sunday when she was sucked down a spillway at the Monticello Dam at Lake Berryessa. The spillway, which drops straight down more than 200 feet, is known as the Glory Hole. It routes excess water from the lake into a 72 foot diameter entrance structure known as the Glory Hole down to a 28-foot-wide exit pipe. Authorities said witnesses reported seeing Schwalek swimming toward the spillway at about 6:30 p.m. Sunday. The woman dropped out of sight after gripping the edge of the hole for about 20 minutes, witnesses said. There has never been a documented case of anyone else falling through the Glory Hole, said Don Burbey of the Solano Irrigation District. UNLUCKY BIRD SWIMS INTO GLORY HOLE - The Video!